St. Joseph police have been notified of a couple traveling with a baby who looked similar to missing 10-month-old Lisa Irwin. Officials said an infant matching her description was seen Wednesday with a middle-aged white male and white female in an older model SUV at the Love’s Travel Stop at the intersection of Interstate 29 and U.S. Highway 169. Their direction of travel was not known. Cmdr. Jim Connors, head of the St. Joseph Police Department’s detective division, said officials have contacted Kansas City Police, who have requested a copy of the store’s surveillance video. Authorities believe Lisa Irwin was taken from her North Kansas City home sometime between 10:30 p.m. Monday and 4 a.m. Tuesday. Actually now you have me wondering and looking because I may be off my rocker but this guy looks like the neighbor who gave an interview and he had a negative vibe about him, towards the parents, and he was smiling/smirking inappropriatly in the interview if he is the same guy. Looking for video now. Interview of neighbor's wife who saw man walking with baby the night Lisa went missing. not the same guy but sure odd. Maybe he's just stoned. On page 2 of comments about half way down - neighbor who lives behind Lisa's house. KANSAS CITY, Mo. - Lisa Irwin’s parents were at their house Wednesday as investigators continue to search the area for clues into the girl’s disappearance. They addressed the public for the first time at a 2 p.m. news conference . Lisa was discovered missing around 4 a.m. Tuesday when her father returned to their home in the 3600 block of North Lister Avenue from work to find her not in her crib. 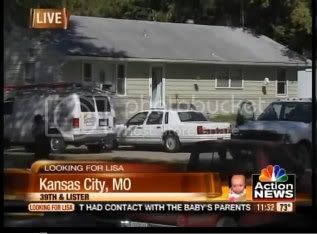 NBC Action News reporter Chris Hernandez reported Lisa’s parents arrived to their home sometime around noon Wednesday, met with family and neighbors at a nearby home and then went with investigators into their back yard. Thanks for the link, catlurker. This old computer fizzled up and won't play it. But if it's not the same guy, then it's fine. Hoping to catch it on the news tonight, cause I'm curious. KMBC has a "Live Wire" blog going, but not much happening now. Has a few good pictures. Police say they have no solid leads in the case. 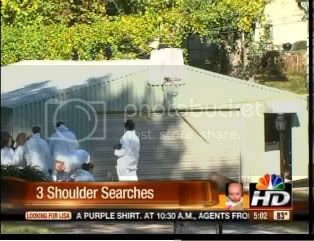 More than 300 investigators continue to look for answers. Many investigators are focused on the family's home. "We've done three shoulder-to-shoulder searches there and we've sent dogs in three times. Three different dogs each time," said Police Capt. Steve Young, Kansas City, MO. I wonder why the dogs aren't catching her scent? The grandparents said they're absolutely heartbroken and their son and daughter-in-law have nothing to do with Lisa’s disappearance. "Absolutely not. I’m not a police officer. You have to have a custody battle…but you have a loving family, cloth knit family,” said Rick Irwin. “That baby is everything to them," said Melanie Irwin. Good question. If the sighting of the man with the baby at midnight is true she was seen only wearing her diaper and being carried close to his chest. So did he removed her clothes and pocket them thus destroying her scent? 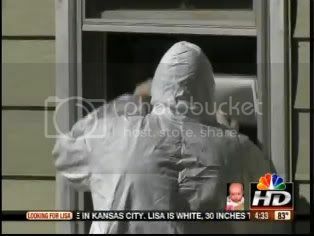 In the very beginning of this video, officers are at the bedroom window on the outside doing something with the window. I noticed the bottom of the window is about shoulder height or higher. How would someone get up into that window without something to climb up on and even if the perp was able to boost himself up, I would think he would make enough noise to wake someone up. this story reminds me of the case years ago..I believe it was Samantha Eissman or something like that? anyone help me out here? she was taken from her crib too..That mom was very suspicious acting..this mother reminded me so much of that mother when she was crying while on camera..dunno..I can't help myself anymore...I am suspicious of anyone who sets off my hinky..and for some reason this mother does..can't explain it, but she comes across as insincere to me..hope I am really really wrong and that baby is ok..
Baby Lisa Missing: Parents Growing Deperate as Search Continues.. Speaking on "Good Morning America" this morning from outside their home in Kansas City, the girl's mother choked back tears and father Jeremy Irwin repeated their plea for anyone with information on their missing toddler to come forward. "[She disappeared] between the time she went to bed and time I went to bed," she said through tears. "I gave her her bottle and put her to sleep, and that was the last when we last saw her." Page created in 6.103 seconds with 19 queries.